Fruits and Milk are two of the most nutritious natural foods available. Today's recipe combines these ingredients in a perfect proportion to get a delicious dessert recipe. This recipe is Indian Vanilla Fruit Custard. 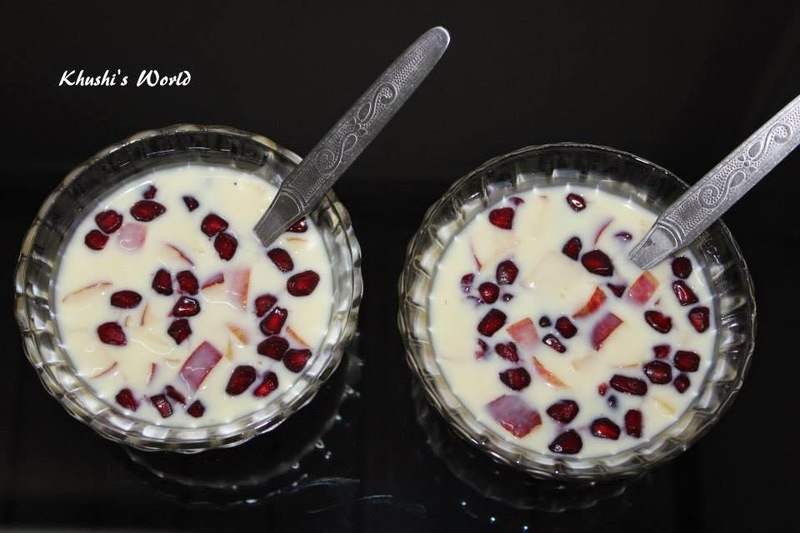 Lets see how to make Fruit Custard. Step 1. Mix the custard powder in ¼ cup lukewarm milk and keep aside. Step 2. Heat remaining milk in a pan and add the custard powder mixture and cook, stirring, till it begins to thicken. Step 3. Add Sugar, Cardamom (Elaichi) powder and stir till it dissolves. Cook for 5 mins more. Step 4. Cool and keep aside. Step 5. Add Pomegranate, dry fruits & Apple pieces. Refrigerate it. I hope you and your family will love this recipe and it will turn out perfectly!! Share your recreations and feedback with us. Also let us know which Fruits is your favorite Fruit.